Scotland is a treasure trove for lovers of the outdoors, despite the notoriously damp, chilly and changeable weather; in fact, mist and cloud often seems to add extra drama to the rugged landscapes of the country. 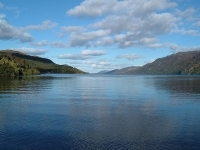 Natural attractions include the famous Loch Ness, and Ben Nevis, the highest peak in Britain. Amongst all this natural beauty, ancient archaeological sites add to the mystery and intrigue: Skara Brae, on the main island of Orkney, is one of the best preserved Stone Age villages in Europe; Orkney also boasts Neolithic monuments like chamber tombs and stone circles; and the Antonine Wall, once the northwestern frontier of the Roman Empire, dates back to about 140 AD. Scotland is also famously rich in romantic old castles, with favourites including Stirling Castle, Edinburgh Castle and Balmoral Castle. Although Scotland's long history is celebrated, the country also boasts some wonderful modern attractions. Edinburgh is a gorgeous mixture of Gothic mystique and fashionable modernity, with great restaurants and shopping as well as museums and historic attractions, and Glasgow is fast establishing itself as a fun and feisty alternative to the capital for travellers. The many whisky distilleries, islands, fishing villages and golf courses also attract droves of tourists to Scotland.